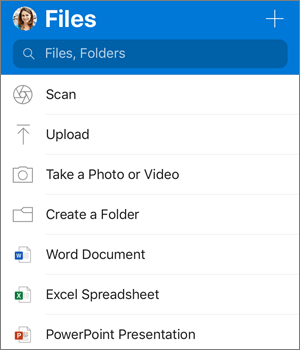 If you are unable to save files created with Office Lens to your OneDrive, try using the OneDrive app's Scan feature instead. Scan is available in OneDrive for iOS and OneDrive for Android mobile apps. The Scan feature lets you take pictures of documents, presentations, or a whiteboard, and save the scanned image as a PDF. In the OneDrive app, tap Add at the top of the screen. If you choose Scan or Take a photo or video, your device's camera app opens. You might be asked if you want OneDrive to access your camera - tap OK to allow your pictures to be saved in OneDrive. Then Save the file to the desired location.